While I was writing last week’s post in which I explored using Google to X-Ray search within specific LinkedIn groups, I decided to perform some general X-Ray search syntax testing to challenge some assumptions, as well as to compare X-Ray results to LinkedIn Recruiter results. 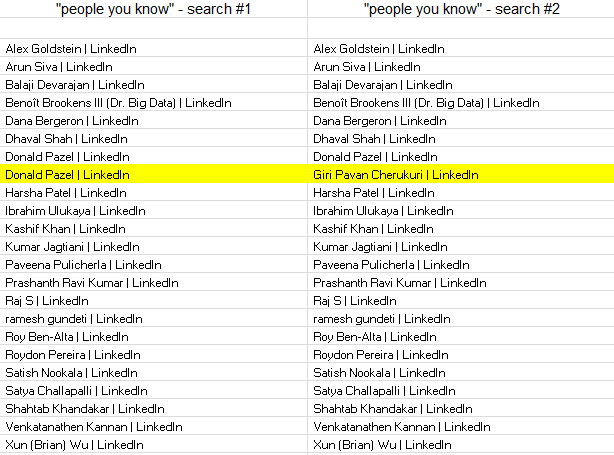 I notice quite a few folks seem to use the “people you know” phrase when using Google to search LinkedIn, and I wanted to see if it was better than other phrases/techniques for isolating LinkedIn profiles and eliminating non-profile false positive results. 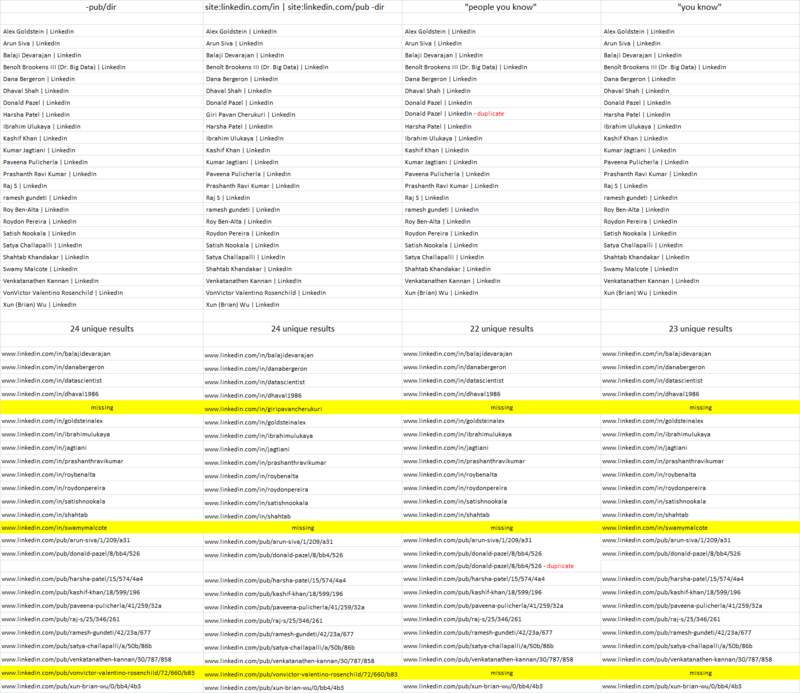 I scraped the total results from each search and sorted them in Excel so I could compare them for any variations. When you look at the chart below, you’ll notice there is very little difference between the 4 different X-Ray searches, but the fact that there are differences at all is interesting. While the searches only vary from 22 to 24 unique results – 2 is 9% of 22. Also, notice that some searches have results that others don’t and one search had duplicate results (“people you know”) while none of the others did. When I ran a [sqoop pig hive] keyword search in LinkedIn Recruiter and selected a location of “Greater New York City Area,” I got 48 results – 2X or 100% more than the best Google X-Ray search above. This is proof positive that when you X-Ray search LinkedIn, you are only finding a fraction of the results available. 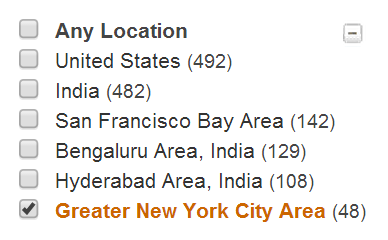 Also, searching for [“location * new york city area”] does in fact find people who have a different location phrase on their profile that is included within LinkedIn’s “greater new york city area,” so this cannot explain the differences in results between LinkedIn Recruiter and Google X-Ray searching. Granted, that’s a small difference – 1 result out of 23 – but the fact that you can get different results from the same search within 5 minutes is a bit disturbing. It also certainly makes performing and replicating these kinds of tests challenging. When I noticed Giri’s profile popping up in the second search above, I decided to check it out. 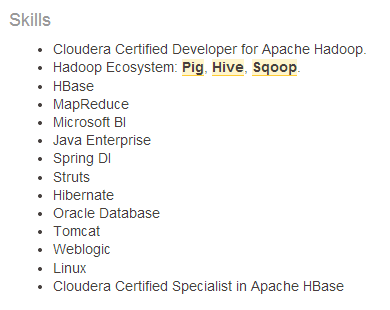 I clicked on his profile link and noticed he is a 3rd degree connection, and because I was logged into LinkedIn, it wouldn’t show me his full profile and I could not confirm that all of my search terms (sqoop, pig, hive) were all there. I decided to type his name into LinkedIn and pull up his profile – then I checked for my keywords. I noticed sqoop wasn’t there. Here’s all I could see in his skills – even though it appeared as though I was looking at his full profile, I clearly wasn’t – otherwise sqoop would have to be present. 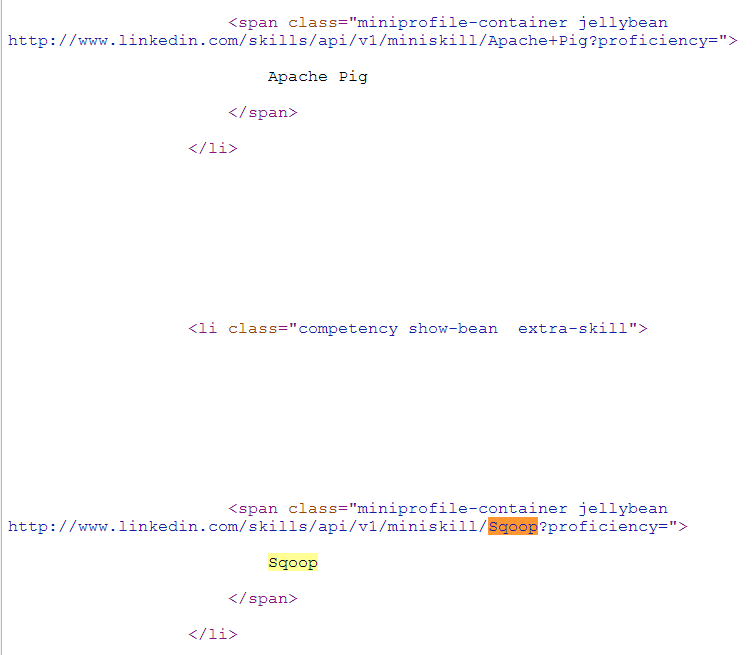 I checked his profile out in Recruiter and could see all of his skills, including sqoop. I then tried another person’s profile and successfully viewed this cached result, but alas, sqoop was still nowhere to be found via CTRL-F.
Now that I had found my search term, I went back to inspect the cached page to see where sqoop could possibly be hiding. 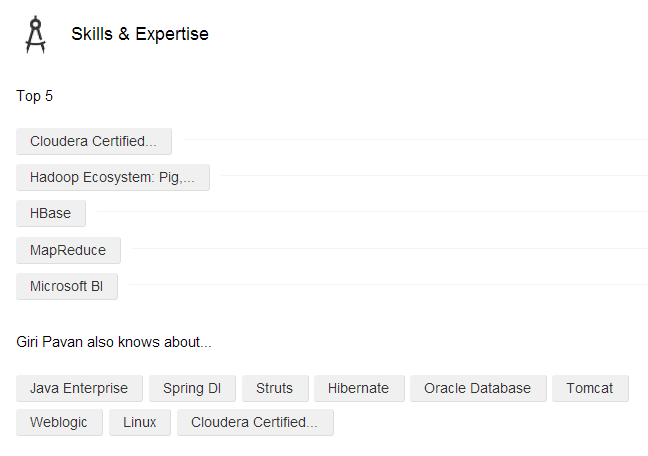 I noticed “View All (50) Skills” was clickable – so I clicked it, and all of the skills were then displayed, including sqoop. Once again I scraped the total results from each search and sorted them in Excel so I could compare them for any variations. You may want to reconsider using the phrase “people you know” in your LinkedIn X-Ray searches to target profiles, as both of my tests showed it had the worst performance compared to other phrases/syntax. Interestingly, simply using “you know” works at least as well as “”people you know,” and in fact outperformed “people you know” – at least in my quick and dirty comparison tests. [-pub/dir] appears to work as well as, and in some cases better than, [site:linkedin.com/in | site:linkedin.com -dir]. As I’ve implored many times before, please don’t just copy and paste other people’s search syntax – it’s easy and it may seem painless, but there can be consequences, such as getting fewer result than you could otherwise. Please experiment more! 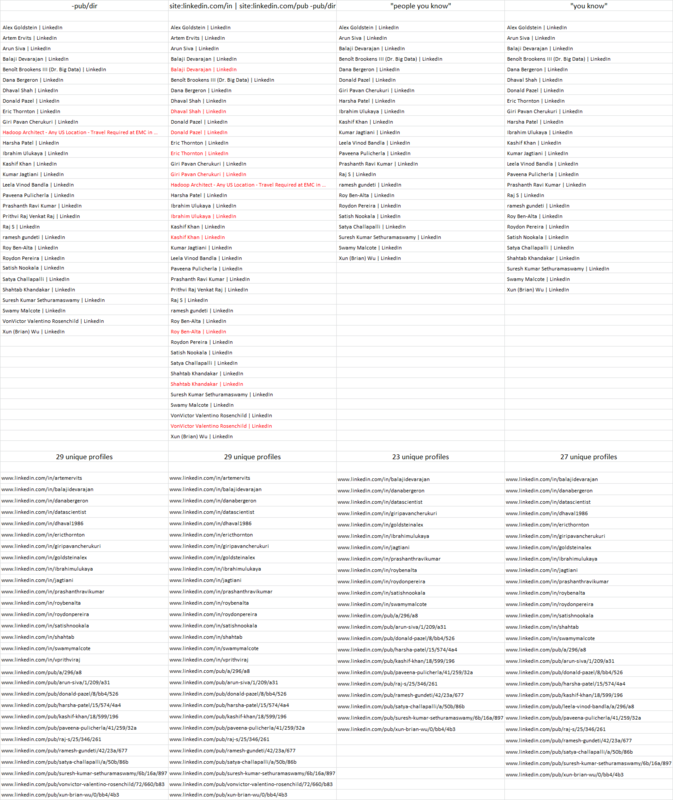 Yes, putting even this minor experiment together was quite tedious – at least the results scraping, formatting and comparison – but as you can see, some discoveries were made that likely could never have been had I not painstakingly compared different searches back to back. Finally, you certainly can’t find everyone on LinkedIn through X-Ray searching – you could be missing up to and even potentially more than half of the LinkedIn profiles that actually exist, for the reasons I detailed thoroughly in the middle of this post.